Liz lives and works in Calgary, Alberta, Canada. She completed her Bachelor of Fine Arts at the University of Calgary in 1997 with a double major in painting & drawing. Since then, her career has included art teaching, painting commissions and ongoing work in her Inglewood studio. Her largest public art project is a 12’x11′ landscape for Brookfield Properties, situated in the West Tower of Banker’s Hall, Calgary. Liz’s work is in the collection of the Alberta Foundation for the Arts as well as in private and corporate collections in Canada, Ireland and the USA. 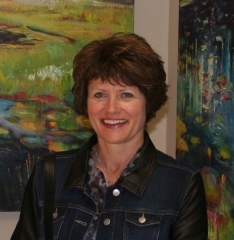 Her exhibition history spans nearly 20 years and has been an active member of the Alberta Society of Artists since 1998. Many recent paintings were inspired/initiated at the Banff Centre, Alberta (2014) and Emma Lake Artist Workshops in Saskatchewan (2011, 2009). Her work has been reviewed in the Edmonton Journal, Leap Magazine and the Calgary Herald. In conjunction with Bluerock Gallery exhibit “Water Stories”, a YouTube video describes her work and process: http://youtu.be/jeIpfSF1iHE .